If you have any interest whatsoever in serving the poor of the world, you need to read The Poor Will Be Glad: Joining the Revolution to Lift the World Out of Poverty, by Peter Greer and Phil Smith. If you are like me, you’ve often thought that if we could just pool enough resources, enough cash, enough food, and ship it to developing nations, the problem of poverty would be solved (actually, when I write that it sounds pretty naive so maybe you’ve never thought that). Peter Greer addresses this mindset with a story about a Rwandan named Jean. Jean seized an opportunity to begin a small poultry business to provide his neighborhood with eggs. He managed to scrape together funds to purchase several fowl, and his business grew. Later, a church in America “adopted” the village where Jean lived and worked. The church decided to donate clothes and supplies. They also imported eggs from a neighboring community and gave them away. Suddenly, this one village was flooded with surplus eggs. It is not difficult to imagine what happened to Jean’s business: people went first to collect the free eggs and bought Jean’s eggs only when the supply of free eggs was depleted. The market price for eggs plummeted in Jean’s village and, as a result, Jean was forced to sell his productive assets, his chickens. The next year, after Jean had left the poultry business, the church that had supplied the free eggs turned its attention to another disaster in another part of the world. 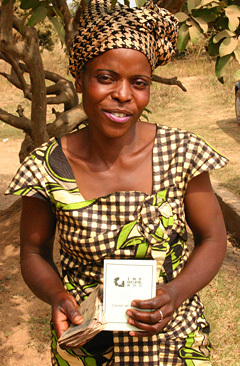 Jean’s community had no capacity to produce eggs locally and was forced to import eggs from a neighboring town. The cost of these eggs was higher than the eggs Jean had sold, so both Jean and his village were hurt economically by the good intentions of one American church. You know those container loads of t-shirts that we give to thrift stores, the ones that eventually get shipped to Africa? These “gifts” almost single-handedly decimated the textile trades in some African nations. We as the church MUST remember that there are larger implications to our giving than we may understand at first glance. While natural disasters and other crisis may require emergency aid and huge amounts of charitable giving, these strategies are not adequate long-term solutions for helping the poor. Microfinance, Peter and Phil insist, is the answer to lifting the world out of poverty. They’ve created a beautiful book, both in content and in appearance. The book is full of stories about how microfinance is changing the landscape of developing nations, and the photographs of these entrepreneurs whose lives have been changed by $40 micro-loans are stunning. Because if it is true and legit and if microfinance really does have that kind of effect on the lives of those in poverty, well, that would change everything. Which is what it’s doing. It’s changing things on a massive scale. And every one of us can be a part of it. For a small amount of money, entire families can be empowered to create entirely new tomorrows. I hope this raises all sorts of questions for you, beginning with: How? And to answer that question, you’ll have to turn the page and start reading this inspiring, informative, moving, world changing, extraordinary book. Phil Smith is a philanthropist and private investor who sits on the boards of several companies. He is the coauthor of A Billion Bootstraps and holds an MBA from the University of Tulsa and a BS in mechanical engineering from Oklahoma State University. I’m a big fan of Peter and Hope Int’l’s work. I also love Kiva, who partners with Hope sometimes. Thanks for this rec, Shawn. Thanks for sharing this Shawn! thanks for the recommendations, maria. Just picked up the book this afternoon… Excited to dig in.. I’ve worked with Kiva in the past too! hey dan! great purchase – check in here tomorrow for a guest post by author (and old Messiah College friend) Peter Greer.